The Edelbrock Performer Manifolds are dual-plane, low-rise intake manifolds with a 180 degree firing order and patented runner design. This combination boosts torque over a wide RPM range, from off-idle all the way up to 5,500 RPM. The Performers are ideal for passenger cars, trucks, tow vehicles and RV's. These manifolds also deliver improved throttle response over stock intakes and are available with non-EGR styles. They accept late-model choke, water neck, alternator, air conditioning brackets and have provisions for oil filler tube. The Edelbrock Performer Intake Manifold delivers superior performance with square-bore carburetors. Horsepower gains from idle to 5,500 RPM, when used with Performer Series square-bore or Thunder Series AVS carburetors. Dyno tests show that the power gains an extra 5 horsepower, 9 foot / pounds and torque across the entire RPM range over their own performer manifolds. 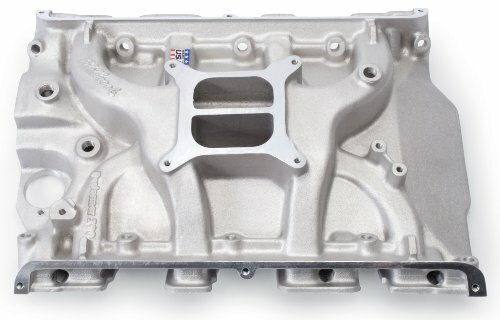 The Edelbrock Performer RPM Air-Gap Intake Manifold is manufactured from aluminum and given a natural finish. The exclusive Air-Gap design features an open space between the intake runners and the hot engine oil resulting in a cooler, denser charge and more power. The runners are tuned up to move the power band 1,000 RPM higher than Performer Air-Gap manifolds, from idle-5,500 RPM up to 1,500-6,500 RPM. It also features nitrous bosses, rear water outlets and two distributor clamp locations. 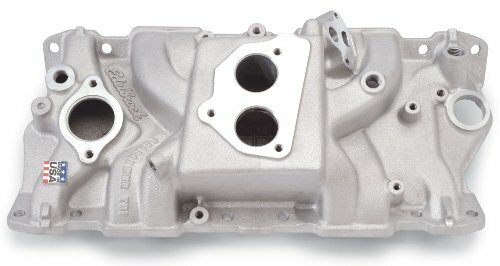 The Edelbrock Performer EGR (Electronic Gas Recirculation) Intake Manifolds are dual-plane, low-rise intake manifolds with a 180 degree firing order and patented runner design. This patented design greatly improves torque over a wide RPM range for excellent throttle response, especially off-idle through the mid-range. The intake manifold directs the air or air-fuel mixture from the throttle body to the intake ports in the cylinder head. The flow typically proceeds from the throttle body into a chamber called the plenum, which in turn feeds individual tubes, called runners, leading to each intake port. It accepts late model waterneck, air-conditioning, alternator and H.E.I. (Heat Energy Ignition). 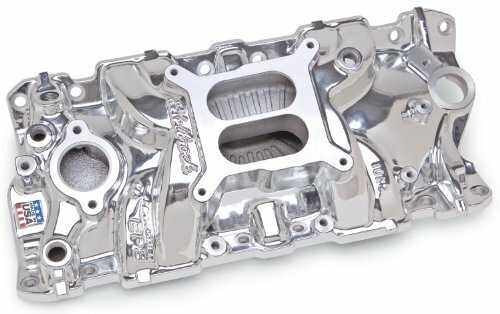 The Edelbrock Performer EPS Intake Manifold features a low-rise, dual plane design with patented runner tuning and a 180 degree firing order. This combination boosts torque over a wide RPM range from idle to 5,500 RPM. They deliver improved throttle response over stock intake and come in non-EGR (Exhaust Gas Recirculation) style. The Edelbrock Performer Manifolds are dual-plane, low-rise intake manifolds with a 180 degree firing order and patented runner design. This combination boosts torque over a wide RPM range, from off-idle all the way up to 5,500 RPM. The Performers are ideal for passenger cars, boats, tow vehicles and RV's. These manifolds also deliver improved throttle response over stock intakes and are available with non-EGR styles. They accept late-model choke, water neck, alternator, air conditioning brackets and have provisions for oil filler tube. The Edelbrock Performer T.B.I. 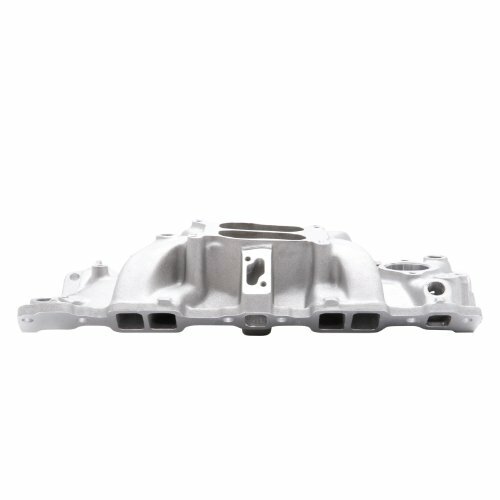 (Throttle Body Injection) Intake Manifolds are dual-plane, low-rise intake manifolds with a 180 degree firing order and patented runner design. This patented design greatly improves torque over a wide RPM range for excellent throttle response, especially off-idle through the mid-range. The intake manifold directs the air or air-fuel mixture from the throttle body to the intake ports in the cylinder head. The flow typically proceeds from the throttle body into a chamber called the plenum, which in turn feeds individual tubes, called runners, leading to each intake port. The Performers are ideal for passenger cars, trucks and RVs. 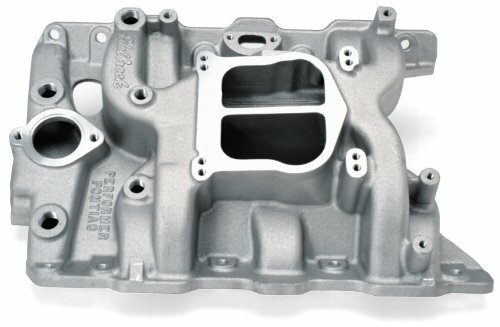 The Edelbrock Performer RPM Intake Manifold is intended for high-performance street or competition engines that run up to 6,500 RPM with maximum power. The front height of the manifold measures 4.20 and the rear 5.25. The Performer RPMs are dual-plane, high-rise intakes with a 180 degree firing order. This manifold produces incredible top-end horsepower while retaining good throttle response. The Performer RPMs have larger plenums and runners to match the free-flowing exhaust, high-lift cams and other modifications of a high output engine. It is not for emissions-equipped engines. A Performer RPM intake gives you the ultimate in street high-performance. It provides power like a single-plane and throttle response like a dual-plane. Shopping Results for "Edelbrock Performer Manifolds"